1. Anti-emetics are your friend. This is the obvious starting place, but it is not always 100% effective on intractable motion sickness. For this trip, my also hurl-prone husband and I both ingested Bonine. Does it say “Less Drowsy Formula” on the label? That’s the one you want. Save the knock-you-out Dramamine for international airline flights. 2. Charter the biggest boat you can find. 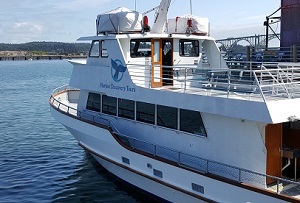 The company we chose, Marine Discovery Tours in Newport, Oregon, boasts the largest tour boat on the Oregon Coast. At 65 feet long with two decks and an enclosed, heated cabin, this one seemed the most likely to absorb some of the wave motion so my stomach wouldn’t have to. Despite barfing in cars and airplanes and on carnival rides, I have ferried through the Irish Sea, San Juan Islands, and Tahiti without getting sick. The boat size matters. Find a large one. 3. Go on a calm day. You didn’t really need me to tell you this one, right? Don’t tempt Triton! 4. Stay on the stern on the lower deck. The front of the deck, the bow, takes the brunt of the oncoming waves, which means it absorbs more vertical motion than the stern (that’s the back of the boat, for you sea-avoiders). If your boat has more than one deck, the upper deck or decks will sway more in the wind. Should you start feeling squidly, head to the rear of the main deck. 5. Pro tip for horse-riders: pretend you are cantering or loping. This made the difference between my husband and me. My husband, who has no riding background, kept trying to brace against the motion of the sea by locking his legs. Eventually, he started feeling greenish and headed astern, which resolved the problem. I grew up with a horse, and as soon as we got out of the shallow swish of the bay and into the deep rhythm of the ocean current, my legs remembered the smooth rocking of my horse’s canter, and I began to roll in unison with the deck. I experienced no seasickness at all, and the trip fulfilled all the glorious promise of the wondrous deep with none of the sickness I had dreaded for years. 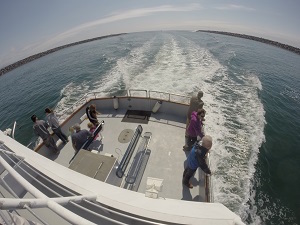 Both the captain and the on-board naturalist were friendly and knowledgeable, and on our expedition we saw crab, gray whale, sea lion, and porpoise! 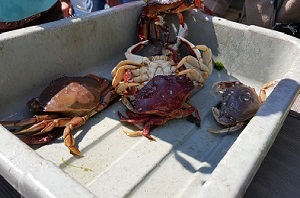 Cruises run from 9 a.m.-5 p.m. Book by calling ahead or visiting their above address on the shore of Yaquina Bay.